James Abram Garfield (November 19, 1831–September 19, 1881) was the twentieth President of the United States. He was a strong opponent of slavery, Garfield was one of the founders of the Republican Party and in 1859 was elected to the Ohio legislature. When the American Civil War broke out Garfield joined the Union Army and was commissioned as a lieutenant colonel. Garfield is the only person in United States history to be a Representative, Senator-elect, and President-elect at the same time. To date, he is the only Representative to be directly elected President of the United States. He was the second U.S. President to be assassinated — Abraham Lincoln was the first. Garfield had the second shortest presidency in U.S. history, after William Henry Harrison's. He held the office from March 5 to September 19, 1881, President Garfield served for a total of six months and fifteen days. Garfield was a minister and an elder for the Christian Church, making him the first member of the clergy to serve as President. He is also claimed as a member of the Church of Christ, as the different branches did not split until the twentieth century. When Garfield relinquished his position as Elder, he reportedly stated, "I resign the highest office in the land to become President of the United States." Garfield was born in Orange Township, now Moreland Hills, Ohio. His father died in 1833 when he was two years old. He grew up cared for by his mother, a brother, and an uncle. 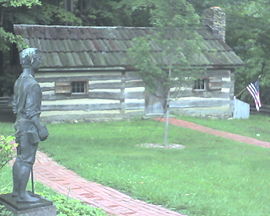 In Orange Township, Garfield attended school, a predecessor of the Orange City Schools. From 1851 to 1854, he attended the Western Reserve Eclectic Institute (later named Hiram College) in Hiram, Ohio. He then transferred to Williams College in Williamstown, Massachusetts, where he was a brother of Delta Upsilon. He graduated in 1856 as an outstanding student who enjoyed all subjects. Garfield ruled out becoming a preacher and considered a job as principal of a high school in Poestenkill (town), New York. After losing that job to another applicant, he accepted a position teaching at the Eclectic Institute. Garfield was an instructor in classical languages for the 1856–1857 academic year, and was made principal of the Institute from 1857 to 1860. On November 11, 1858, he married Lucretia Rudolph. They had seven children. One son, James R. Garfield, followed him into politics and became Secretary of the Interior under President Theodore Roosevelt. 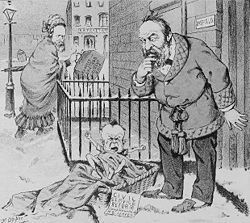 An 1881 Puck cartoon shows Garfield finding a baby at his front door with a tag marked "Civil Service Reform, compliments of R. B. Hayes." Hayes, his predecessor in the presidency is seen in the background dressed like a woman and holding a bag marked "R. B. Hayes' savings, Fremont, Ohio". In 1863, he re-entered politics, being elected to the United States House of Representatives for the 38th Congress. Garfield was promoted to major general after the Battle of Chickamauga, shortly after he had been elected. He left the army and returned to Ohio to take his seat in Congress. He succeeded in gaining re-election every two years up through 1878. In the House during the Civil War and the following Reconstruction era, he was one of the most hawkish Republicans. In 1872, he was one of many congressman involved in the Crédit Mobilier of America scandal, this scandal involved the Union Pacific Railroad and the Crédit Mobilier of America construction company. Garfield denied the charges against him and it did not put too much of a strain on his political career since the actual impact of the scandal was difficult to determine. In 1876, when James G. Blaine moved from the House to the United States Senate, Garfield became the Republican floor leader of the House. 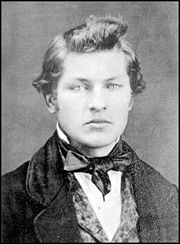 In 1880, Garfield's life underwent tremendous change with the publication of the Morey letter. The three-sentence letter written on congressional stationery, implied that Garfield favored increased Chinese immigration. Chinese immigration had become a highly politicized issue and all candidates were on record as being against further immigration. Garfield made no comment on the letter, because the forgery was so well crafted, he was unsure whether he had written it. Hand writing experts eventually declared the document a fabrication, but the delay and silence by Garfield hurt him politically. When Democratic U.S. Senator Allen Granberry Thurman's term ended, the Ohio legislature, which had recently again come under Republican control, chose Garfield to fill Thurman's seat. However, at the Republican National Convention Garfield gained support for the party's Presidential nomination, and on the 36th ballot Garfield was nominated, with virtually all of Blaine's and John Sherman's delegates breaking ranks to vote for the dark horse nominee. Ironically, the U.S. Senate seat to which Garfield had been chosen ultimately went to Sherman, whose Presidential candidacy Garfield had gone to the convention to support. In the general election, Garfield defeated the Democratic candidate Winfield Scott Hancock, another distinguished former Union Army general, by 214 electoral votes to 155. (The popular vote had a plurality of 9,464 votes out of more than nine million cast.) 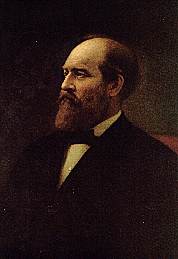 The third of the Ohio presidents, Garfield took office on March 4, 1881. 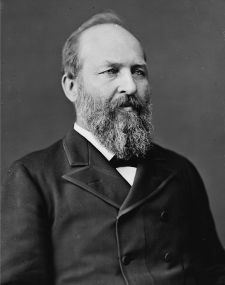 President Garfield believed that the spoils system was damaging to the Presidency while more urgent national concerns needed to be addressed. Garfield's predecessors, Grant and Hayes, had both advocated civil service reform. By 1881, civil service reform associations had organized with renewed energy across the nation, including New York. 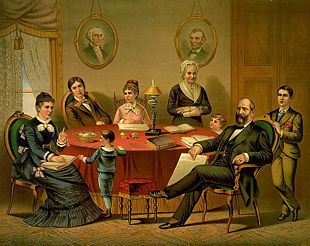 Some reformers were disappointed that President Garfield had advocated limited tenure only to minor office seekers and had given appointments to his old friends. Many prominent reformers remained loyal and supported Garfield. Previously in April, 1880 there had been a Congressional investigation into corruption in the Post Office Department, where profiteering rings allegedly stole millions of dollars, employing bogus mail contracts called "star routes." In 1880, Garfield's predecessor, President Hayes, stopped the implementation of any new "star route" contracts in a reform effort. In April, 1881 President Garfield was given information from Attorney General Wayne MacVeagh and Postmaster Thomas L. James of postal corruption by an alleged "star route" ringleader, Second Assistant Postmaster-General, Thomas J. Brady. Garfield immediately demanded Brady's resignation and started prosecutions led by Postmaster James that would end in the famous "star route" indictments and trials for conspiracy. When told that his party, including his own campaign manager, Stephen W. Dorsey, was involved, Garfield directed MacVeagh and James to root out the corruption in the Post Office Department "to the bone," regardless of where it might lead. Brady resigned immediately on President Garfield's demand, and was eventually indicted for conspiracy. After two "star route" ring trials in 1882 and 1883, the jury found Brady not guilty. Garfield appointed Richard A. Elmer as Brady's replacement. The plight of African-American civil rights weighed heavily on Garfield's presidency. During Reconstruction, freedmen had gained citizenship and suffrage that enabled them to participate in state and federal offices. Garfield believed that their rights were being eroded by southern white resistance and illiteracy, and was vitally concerned that blacks would become America's permanent "peasantry." The President's answer was to have a "universal" education system funded by the federal government. Garfield's concern over education was not exaggerated; there was a 70 percent illiteracy rate among southern blacks. Congress and the northern white public, however, had lost interest in African-American rights. Federal funding for universal education did not pass Congress during the 1880s. President Garfield appointed several African-Americans to prominent positions: Frederick Douglass, recorder of deeds in Washington; Robert Elliot, special agent to the U.S. Treasury; John M. Langston, Haitian minister; and Blanche K. Bruce, register to the U.S. Treasury. Garfield began to reverse the southern Democratic conciliation policy implemented by his predecessor, Rutherford B. Hayes. In an effort to bolster southern Republican unity Garfield appointed William H. Hunt, a carpetbag Republican from Louisiana during Reconstruction, as Secretary of the Navy. Garfield believed that Southern support for the Republican party could be gained by "commercial and industrial" interests rather than race issues. To break hold of the resurgent Democratic Party in the Solid South, Garfield cautiously gave senatorial patronage privilege to Virginia Senator William Mahone of the biracial independent Readjuster Party. During President Garfield's limited tenure, he appointed several ambassadors, notably James R. Lowell as U.S. minister to England; and the famous author of Ben-Hur and former Union Civil War general, Lew Wallace, as U.S. minister to Turkey. From June 27 to July 1, 1881, President Garfield appointed 25 foreign ministers and consuls. He also appointed Sec. Blaine's son third assistant to the Secretary of State. Garfield's Secretary of State James G. Blaine had to contend with Chinese immigration, fishing disputes with Britain, and obtaining U.S. recognition from Korea. Blaine's primary task was settling a complex international war between Chile, Bolivia, and Peru that started on April 5, 1879, known as the War of the Pacific. In January 1881, Chile's naval forces had captured the Peruvian capital city Lima. Rather than remain neutral, Blaine chose to side with Peruvian leader Fracisco G. Calderón, who had been appointed by the Chilean government. Having concern over potential British military involvement in the war, on June 15, 1881, Blaine stressed that the conflict be resolved by consent of the Latin American countries involved and that the Peruvian government pay Chile an indemnity rather than cede the contested land. In November 1881, Blaine extended invitations to Latin American countries for a conference to meet in Washington the following November. Nine countries had accepted; however, these invitations were withdrawn in April 1882 when Congress and President Arthur, Garfield's successor, cancelled the conference. Conflicting U.S. diplomatic negotiation attempts had failed to resolve the war. In October 1883, the War of the Pacific was settled by the Treaty of Ancón. Garfield had urged that the nation's ties to its southern neighbors be strengthened. Garfield continued to stress the importance of these ties in succeeding years and advocated that the Panama Canal be constructed by the U.S. and solely under U.S. jurisdiction. Less than four months into his term, Garfield was shot by delusional religious fanatic Charles Julius Guiteau on July 2, 1881, at 9:30 in the morning. Guiteau apparently was disgruntled by failed efforts to secure a federal post. The President had been walking through the Sixth Street Station of the Baltimore and Potomac Railroad (a predecessor of the Pennsylvania Railroad) Washington, D.C., on his way to his alma mater, Williams College, where he was scheduled to deliver a speech, accompanied by Secretary of State James G. Blaine, Secretary of War Robert Todd Lincoln and two of his sons, James and Harry. The station was located on the southwest corner of present day Sixth Street Northwest and Constitution Avenue in Washington, D.C., a site that is now occupied by the National Gallery of Art. As he was being arrested after the shooting, Guiteau excitedly said, "I am a Stalwart of the Stalwarts! I did it and I want to be arrested! 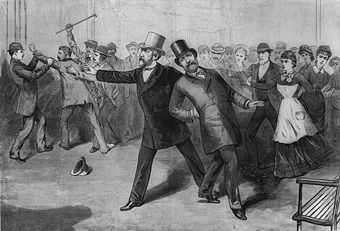 Arthur is President now," which briefly led to unfounded suspicions that Arthur or his supporters had put Guiteau up to the crime. (The Stalwarts strongly opposed Garfield's Half-Breeds; like many Vice Presidents, Arthur was chosen for political advantage, to placate his faction, rather than for skills or loyalty to his running-mate. It was thus conceivable that he might have been involved in the assassination.) 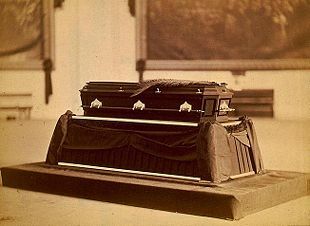 Guiteau was upset because of the rejection of his repeated attempts to be appointed as the United States consul in Paris—a position for which he had absolutely no qualifications—and was mentally ill. Garfield's assassination was instrumental to the passage of the Pendleton Civil Service Reform Act on January 16, 1883. One bullet grazed Garfield's arm; the second bullet lodged in his spine and could not be found, although scientists today think that the bullet was near his lung. Alexander Graham Bell devised a metal detector specifically for the purpose of finding the bullet, but the metal bed frame Garfield was lying on made the instrument malfunction. Because metal bed frames were relatively rare, the cause of the instrument's deviation was unknown at the time. Garfield became increasingly ill over a period of several weeks due to infection, which caused his heart to weaken. He remained bedridden in the White House with fevers and extreme pains. In early September, the ailing President was moved to the Jersey Shore in the vain hope that the fresh air and quiet there might aid his recovery. He died of a massive heart attack or a ruptured splenic artery aneurysm, following blood poisoning and bronchial pneumonia, at 10:35 p.m. on Monday, September 19, 1881, in Elberon, New Jersey, exactly two months before his 50th birthday. During the eighty days between his shooting and death, his only official act was to sign an extradition paper. Guiteau was found guilty of assassinating Garfield, despite his lawyers raising an insanity defense. He insisted that incompetent medical care had really killed the President. Although historians generally agree that while poor medical care was a contributing factor, it was not a legal defense. Guiteau was sentenced to death, and was executed by hanging on June 30, 1882, in Washington, D.C. Unfortunately, Garfield's legacy as president is as brief as his term in office. His administration will be remembered for continuing the struggle over political patronage and the beginnings of a friendlier policy toward Latin America. Ironically Garfield's death was caused by a man denied political position through patronage. This page was last modified on 16 March 2018, at 15:54.